* For corn free omit baking powder. Use ½ tsp. Baking soda and 1 tsp cream of tartar. cocoa and stir until combined. Place eggs then beans in a food processor, blender or magic bullet. Pulsate until mixture is smooth. mixed well. Add the remaining 1 tsp vanilla and the almond extract. Mix only until blended. chocolate is completely mixed. Pour onto a greased 9 x 13 cookie sheet. Spread to evenly distribute. Bake10 - 12 minutes or until a toothpick inserted comes out clean. Let cool while making the topping. Pour heavy whipping cream, 1 tsp vanilla, and almond extract into the bowl of a blender. Whip using the wire whisk until stiff peaks begin to form. Slowly pour in all but 2 Tablespoons of the powdered fructose and whip to incorporate. Spoon mixture into a seperate bowl. Place the room temperature cream cheese, remaining 2 Tablespoons powdered fructose, and cream together. Gently pour into the whipping cream and with a folding method mix together. Spread mixture on top of cooled brownie and top with blueberries and sliced strawberries. 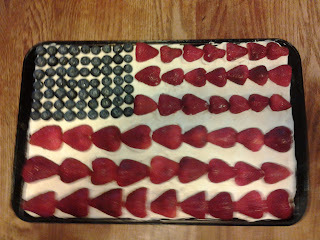 For the flag I placed blueberries 7 down and 9 across. Feeds 10 - 12 Refrigerate any leftovers.